Just like a piece of glass long tumbling in the sea, our Sea Glass collection is simply stunning and comes in a variety of soft cheerful, and timeless colors. Semi-sheer and softly textured, they allow light in, yet still provides a degree of privacy. With its gently slubbed semi sheer texture, Sea Glass is well suited for layering or standing alone on its own. 1 1/2" rod pocket, 1 1/2" header. Use a standard one inch clear or white rod for hanging. Decorative rod may also be used. Use this beautiful Tailored Valance along with our Tier Curtain Pairs offered in three lengths. This custom valance measures 50 inches wide by 16 inches long. Use it with the Swag Valance to accommodate wider windows or it look great on its own for any window measuring approximately 25 inches wide for a gathered look, or 40 inches for the flat look. 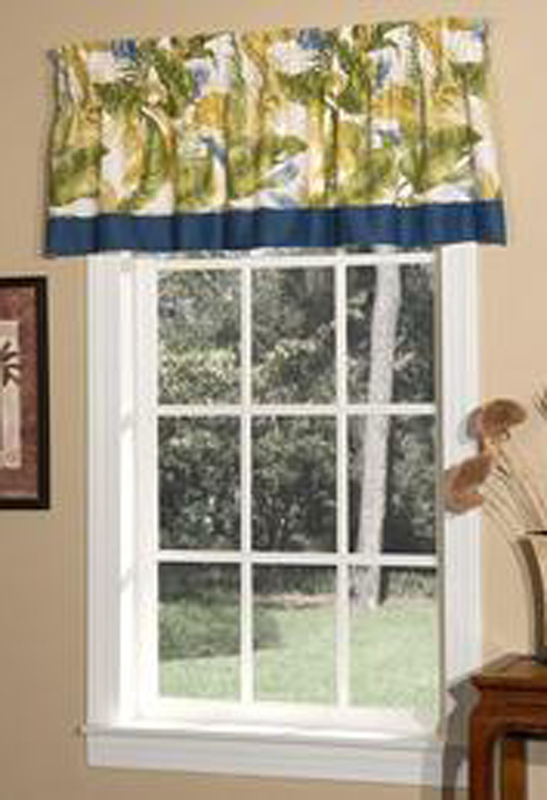 The Corded Filler Valance features a 3-inch rod pocket, 2-inch header and the self cording along the bottom edge makes this custom window valance flow perfectly when gathered on the rod. This custom valance is fully lined with high quality Luster Sateen lining (off white), the best quality in the industry. You will love the meticulous workmanship and fabric quality we put into making the best to be found anywhere. Use with a 2 ½-inch continental rod. PHOTO ILLUSTRATES (2) TWO 50" WIDE INSERT VALANCES ON A 41" WIDE ROD. Insert Valances are sold individually, one per package. Also use them with the Bailey Swag to accommodate wider windows. 3" rod pocket, 1-1/2" header. Use a 2-1/2" continental rod or decorative rod for hanging. Bottom edge is self corded. Fully lined. 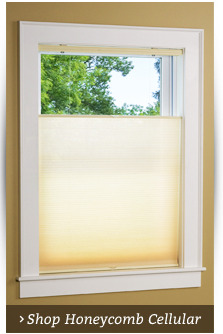 One Insert Valance fits a 25 - 30" single window, two fits a standard single window. Featuring a paisley pattern and self-corded edge, this Bailey insert valance can be paired with the Bailey swag set for wider windows. 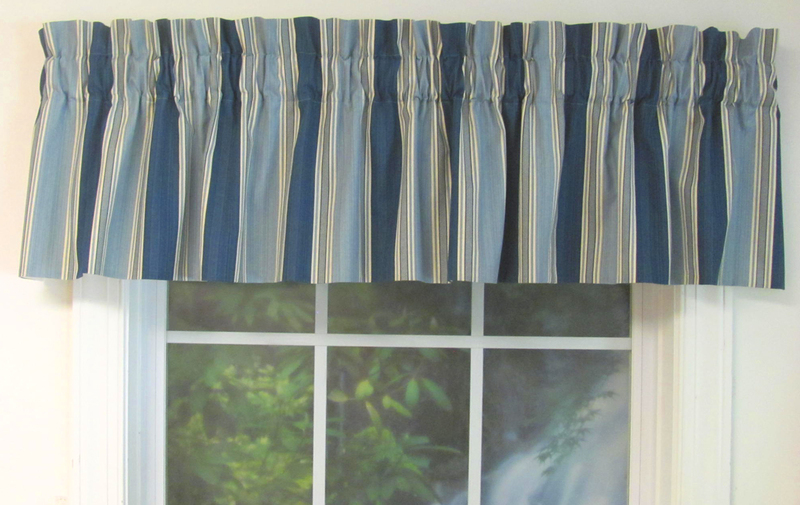 This American-made insert valance measures 50 by 15 inches and comes in four colors (beige, blue, onyx and mocha). It features a 1 ½-inch header and three-inch rod pocket (for use with a 2 ½-inch continental rod). It's fully lined and fits a 25- to 30-inch window. Made from 100 percent cotton and machine-washable (gentle cycle cold, tumble dry low). 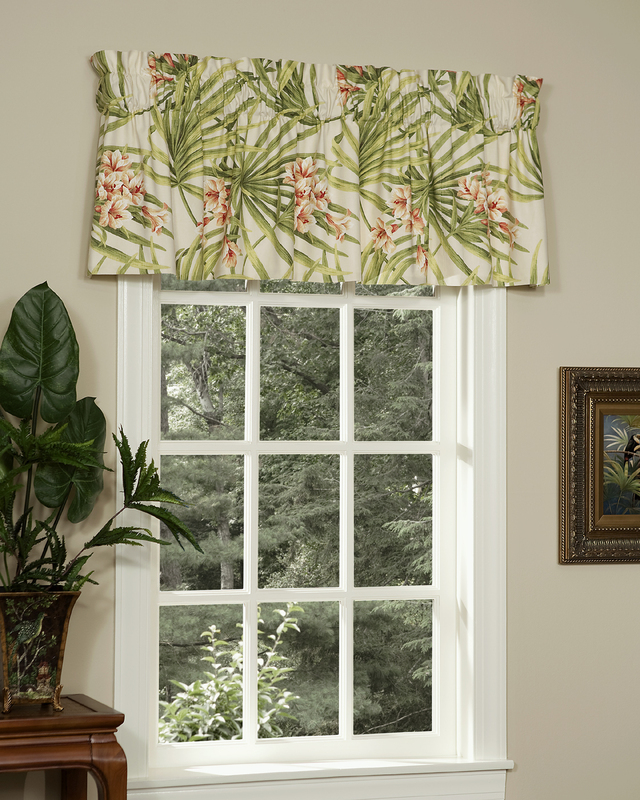 For a unique look that will brighten up any space, get the Beacon Fairfield valance from The Curtain Shop. This American-made valance measures 52 inches wide by 17 inches long. 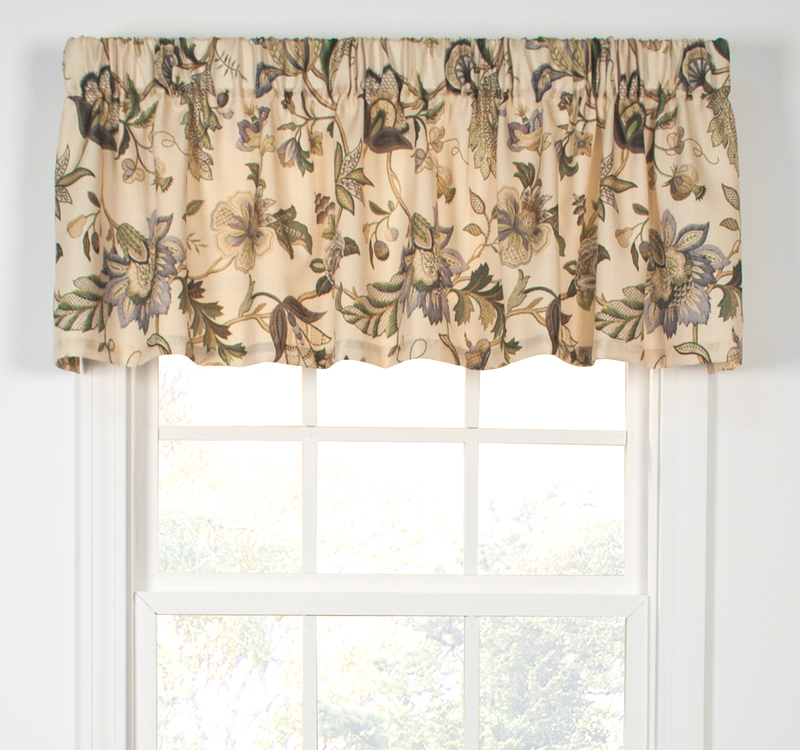 The stylish Beacon Fairfield valance includes two layers, including a fully lined bottom layer. The top layer features a paisley print and scalloped edge, while the bottom has a straight edge and striped fabric. This valance fits a single window with an outside mount of up to 46 inches. Fits a single window up to 46" outside mount. Fits a single window. Use multiples to accommodate wider windows. Photo shows one Tailored Valance in Sage. Use two for a standard window approximately 40" wide, for a gathered look. One 50" wide valance gathered fits a 25" wide window. The Colburn Insert Window Valance will add a handsome topper to standard windows or fit between our two-piece Colburn swag valances set for larger windows. The small check pattern is a classic look that also coordinates well with contemporary décor. It's available in warm shades of canyon, charcoal, geranium or mineral at The Curtain Shop. 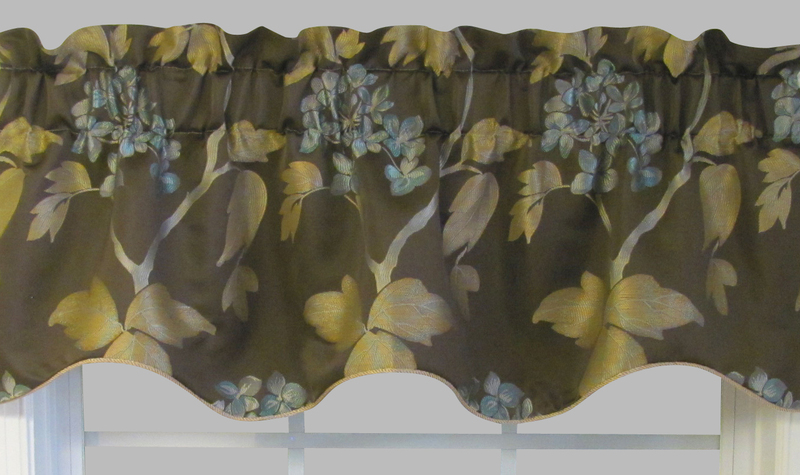 This insert valance is 50 inches wide and 16 inches long. The Colburn Insert Valance fits perfectly between the 2 piece Colburn Swag Valance to accommodate wider windows. Figure between a 2:1 to 2.5:1 ratio for a perfect fit. Choice of colors: Canyon, Geranium. Dimensions: 70" wide x 13" long. Fits a standard single window. 3" rod pocket, 2" header, 1 inch bottom hem, not lined. Not available in Black or Gold. Soften your space with this Sea Glass insert valance. The semi-sheer fabric comes in white, natural, pink and blue. Measuring 42 inches by 15 inches, it has a full-bodied look that brings movement and texture to the window area. This Sea Glass valance includes a 1 ½-inch rod pocket and 1 ½-inch header for use with a standard one-inch clear or white rod or a decorative rod. Pair with the matching swag for wider windows. 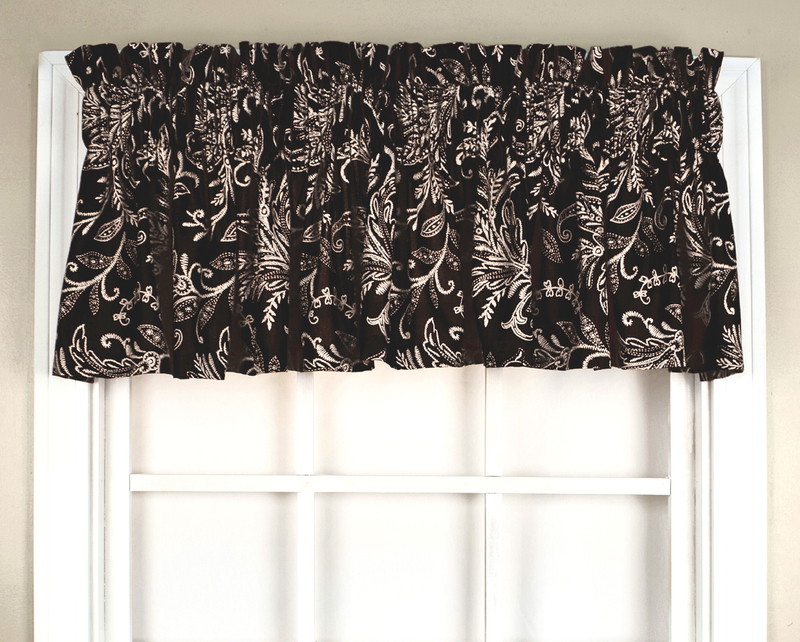 This simple valance adds a timeless look to any room thanks to its stylish Seersucker print. It comes in four lovely colors: white and natural. The valance measures 60 inches wide by 12 inches long and includes a 1-inch header and 1-inch rod pocket. It's made from 100 percent cotton. Machine wash cold on gentle, tumble dry on low and cool iron as needed. Matching Seersucker accessories, including kitchen curtains and shower curtains, are available. This grommet-top, thermal-insulated valance features Homespun fabric in linen, harvest, Spanish moss, cornflower blue or sienna. You'll love the way the double lining keeps you warm in the winter. Both linings are made from a cotton/poly blend to maximize the fabric's thermal properties. You can hang this 40- by 14-inch valance by threading through the back tabs for a pleated look or gathering it through the rod pocket for a traditional look. Machine wash cold on gentle and line dry. With two linings, the outer lining is 80% Polyester/20% Cotton. The inner lining is 50% Polyester/50% Cotton Flannel for extra insulation. 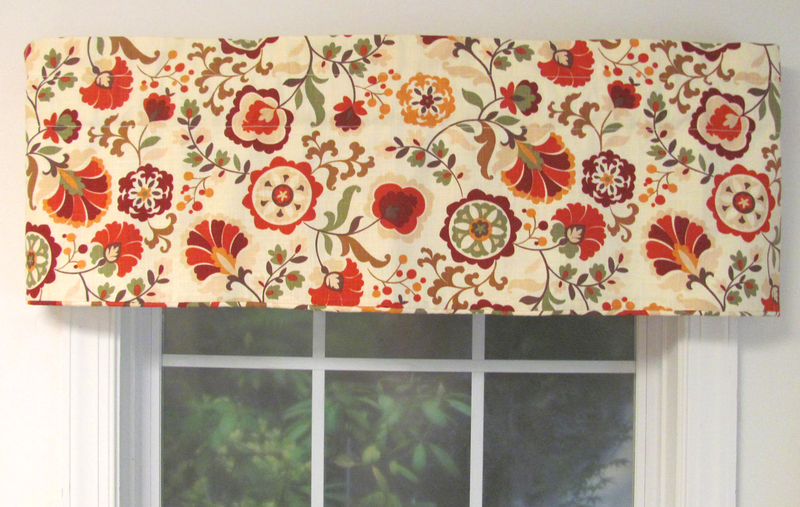 Two Ways to Hang; Thread your rod through back tabs of this beautiful Valance and you'll love its full pleated look, or gather it through the rod pocket for a traditional look. Weathermate tab top window valances by Thermalogic have a thermal shade backing to keep out harsh sunlight while protecting against cold or heat. These insulated valances are available in 11 colors from The Curtain Shop. They are machine washable window toppers that look great in home, office, retail or country club settings. The face is 100 percent cotton. The energy-saving 100 percent acrylic suede backing helps mute sound and reduce glare on computer monitors and television screens, too. The white backing meets standard condominium requirements. This Weathermate Thermalogic valance is 40 inches wide and 15 inches long. We recommend ordering two for a standard single window and multiples for wider windows. 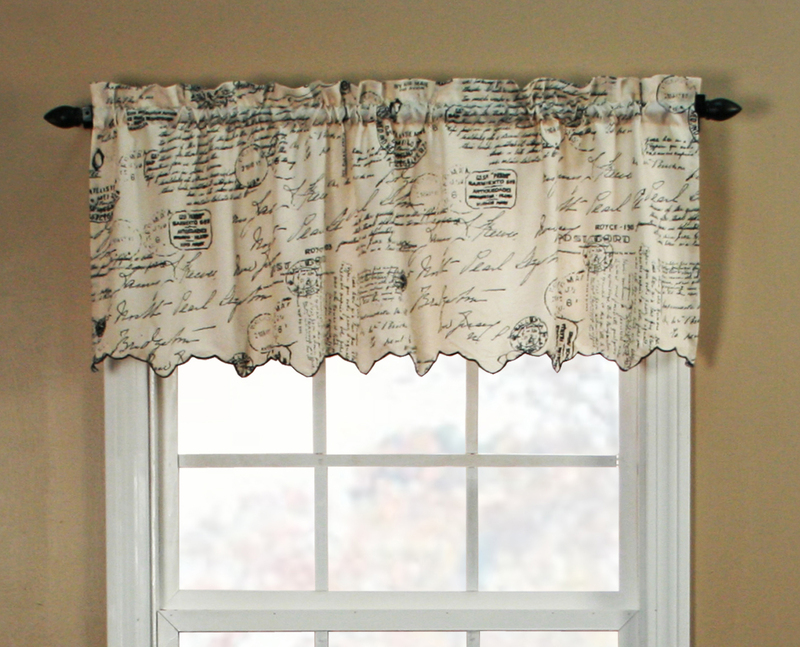 Add a unique look to any space with the Script valance. The print features a handwritten look and randomly trimmed bottom edges. This gives it the look of time-worn paper and letters from decades past. It measures 48 inches wide by 15 inches long and includes a 1 ½-inch header and a 1 ½-inch rod pocket. This product is imported by Ellis Curtains. 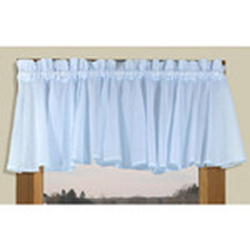 The Script fabric valance is made of durable polyester and is easy to care for. Enjoy the look of fine linen with these 100 percent cotton Hemstitch straight window valances in white with open needlework detailing from The Curtain Shop. 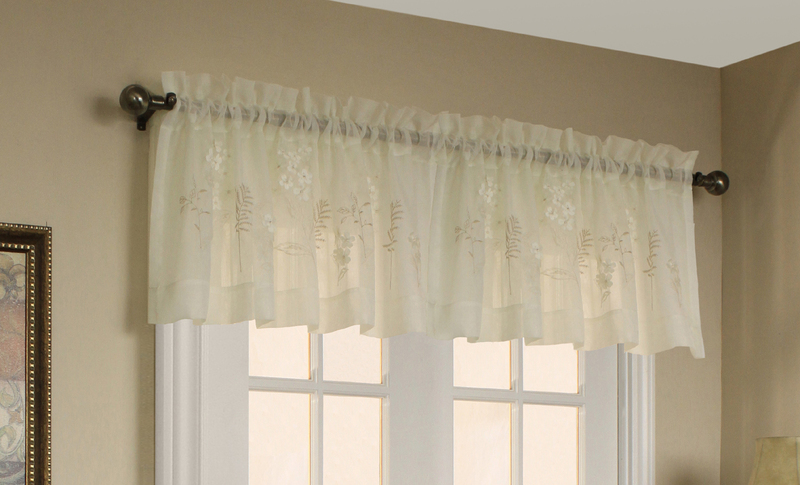 Expert craftsmanship defines this valance with a straight-border design. 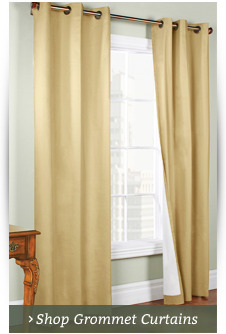 The generous 80-inch width will create a gathered look below and above the curtain rod pocket. Brighten the look of bathrooms, kitchens, bedrooms and weekend cottages. Because this valance will complement traditional and modern décor, it's a popular gift for bridal showers and weddings. The length is 12 inches. 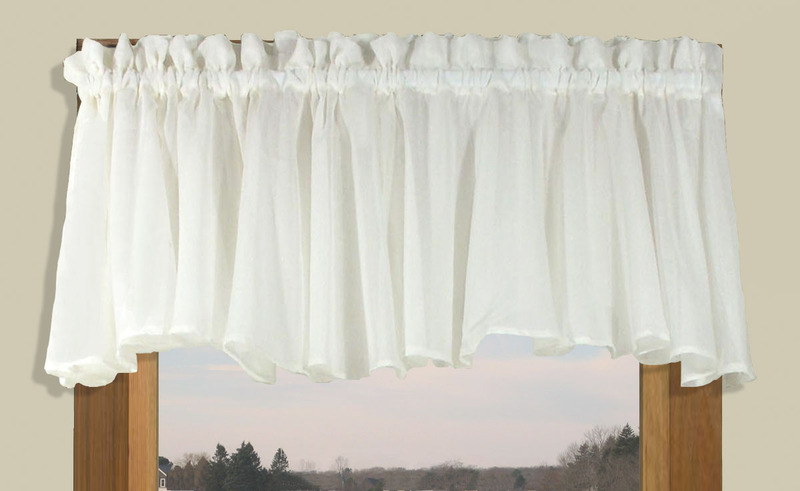 Choose white or natural when you order this lovely Pintuck flat valance from The Curtain Shop. The pintuck valance has a traditional look that's perfect for adding style and dimension to your draperies. Meanwhile, these neutral colors make it easy to match or complement your existing curtains. 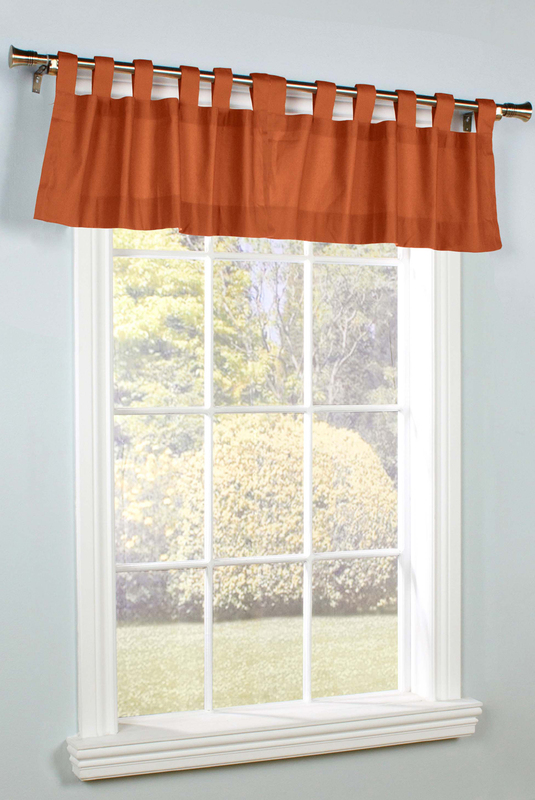 Made from 100 percent cotton, this machine-washable flat window valance measures 72 inches by 12 inches. A rod pocket is included for easy installation. 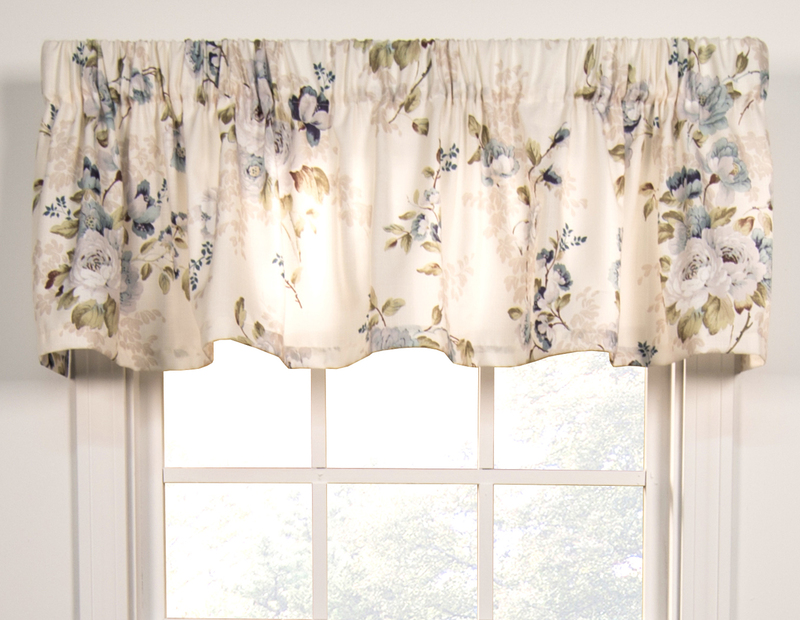 For country charm in your home, add this Climbing Roses Climbing Roses lined swag insert valance. It features a lovely red floral print. Though it looks great on its own, coordinating plaid tier curtains or a matching three-piece swag set may be ordered separately. 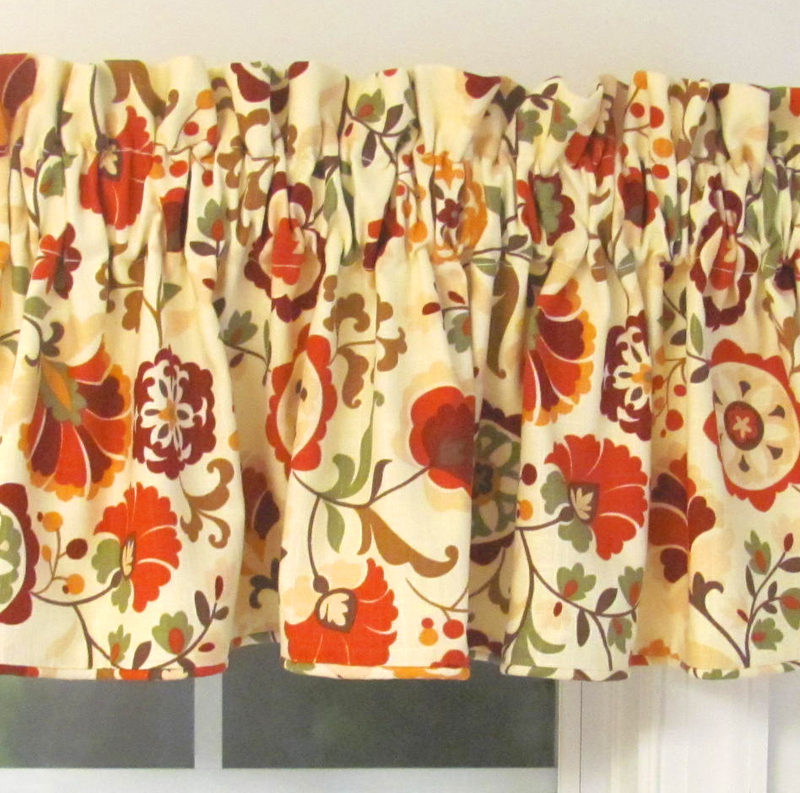 This imported valance measures 28 by 12 inches and is made with 100 percent cotton. Machine wash cold on gentle and tumble dry on cool. A cool iron may be used for touchups. 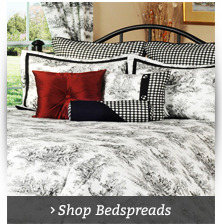 Coordinating Plaid 56" wide Tier Curtains can be ordered in 24" and 36" lengths. Machine wash cold water, gentle cycle. Tumble dry cool heat. Cool iron for touch-up. Dimensions: 28"W x 12"L Use with 3pc Swag Set to accommodate wider windows. Multi-colored large scale plaid on a faux silk fabric. 3" rod pocket, 2" header, and made of 100% Polyester. Photo show Tailored Valance in Plum. 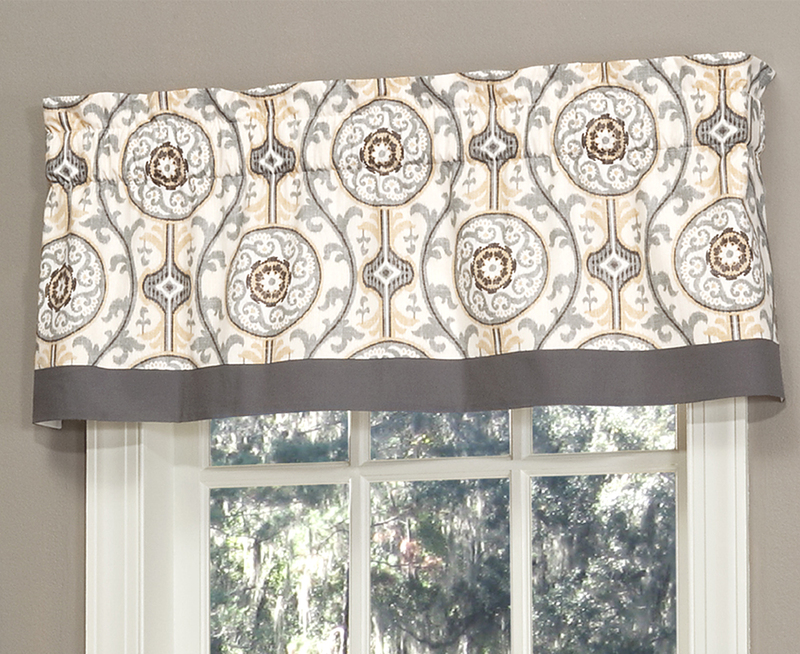 Thanks to its simple design, the Glasgow valance adds a timeless look to any room. It comes in six rich colors and is cut on the bias for maximum fullness. 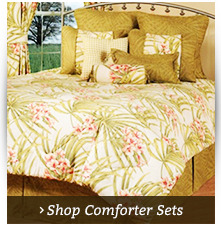 Use it on its own or pair it with a matching two-piece swag set or tier curtains for wider windows. This valance measures 84 inches wide by 15 inches long and is made of 100 percent polyester. Machine wash cold on gentle, tumble dry on low and cool iron as needed. 100% Polyester. Machine wash cold water gentle cycle, tumble dry low heat. Cool iron as needed. 1.5" rod pocket, 2" header. Create a lovely design in any space with the Logan Plaid tailored valance. Measuring 70 inches wide by 12 inches long, this valance features a 1 ½-inch rod pocket and a 2-inch header. This Logan valance is made in the U.S. on 7-ounce duck cloth made of 100 percent cotton. The large-scale monochromatic design comes in red, blue or green tones. Matching accessories are available. Dimensions: 50"W x 13"L. 3" rod pocket, 2 1/2" header, and fully lined. Can be used with the 36" or the 63" Swag Valance to extend out for wider windows, or stands alone on its own. Use a 2 1/2" Continental Rod for hanging. Display the Seaworthy Beach Print 50-inch valance in any room to evoke a relaxing coastal vibe. The orange coral or light blue aqua colored curtains have a starburst-shaped seashell design of conchs, clams and other assorted shells and coral. The sunny beach won't be far when you have these attractive curtains hanging in your home. The valance measures 50 inches wide by 13 inches long and has a 3-inch rod pocket, 2 ½-inch header and is fully lined. This curtain can be used with the 36-inch or the 63-inch swag valance to extend out for wider windows, or it can stand alone on its own. Use a 2 ½ inch continental rod for hanging. These quality curtains are made of cotton and manufactured in the U.S.A.
Dimensions: 50"W x 18"L. Fits a small window roughly 26" wide. Use two Alan Filler Valances to accommodate a standard single window. Designed to gather with between a 2 to 1 and 2 1/2 to 1 ratio of fullness. It has a 3" rod pocket, 2" header and is fully lined in off white fabric. Add rich colors to your home with the Hydrangea Cocoa Alana filler valance featuring brown, taupe and aqua tones and a scalloped bottom edge with rope trim. Measuring 50 by 18 inches, it fits a smaller window (roughly 26 inches wide). Use multiple valances for larger windows. Allow for a 2:1 or 2.5:1 ratio of fullness. 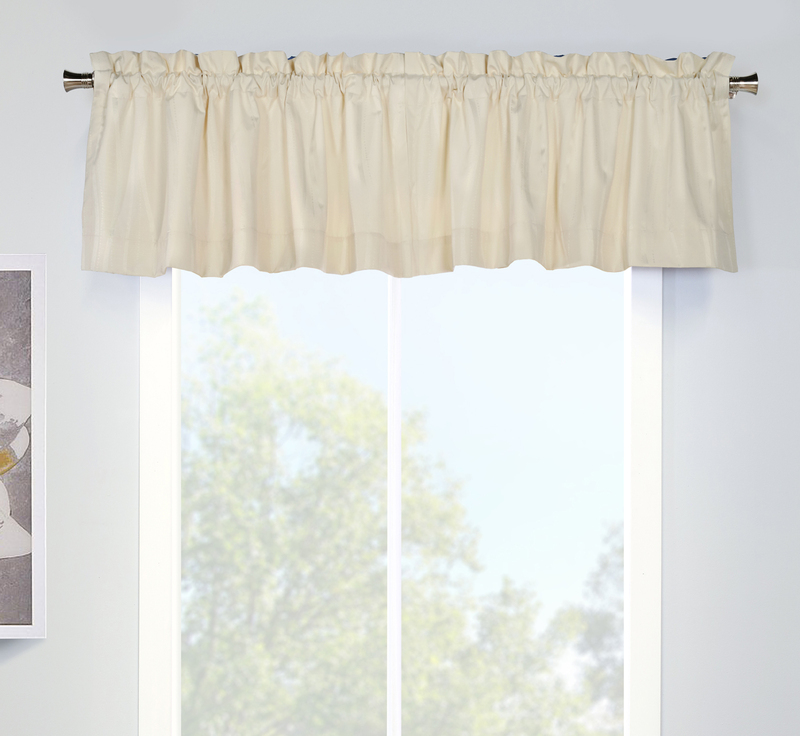 This valance features a three-inch rod pocket, two-inch header and in fully lined with off-white fabric. A gorgeously colorful Jacobean print made of machine washable 100% Polyester Pebble Beach base cloth. 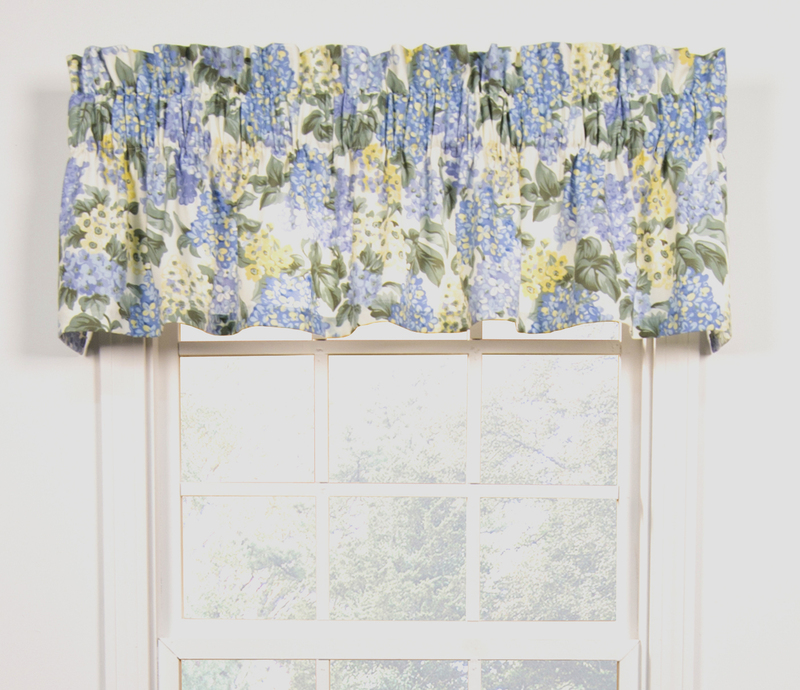 The Brissac Tailored Valance features a three inch rod pocket with no header, and is not lined. Imported. Offered in four colors that are sure to delight and embellished with etchings of floating leaves in beige, this lovely tailored valance is made of 52% Polyester, 48% Cotton, and is machine washable. Features include three inch rod pocket and two inch header. Not lined. Match with with a pair of tier curtains and tailored curtain panels. Toss pillows and shower curtain is also available. The Pole Top Valance goes with our Hydrangea Pole Top Panels. Use a separate rod to hand with the panels. 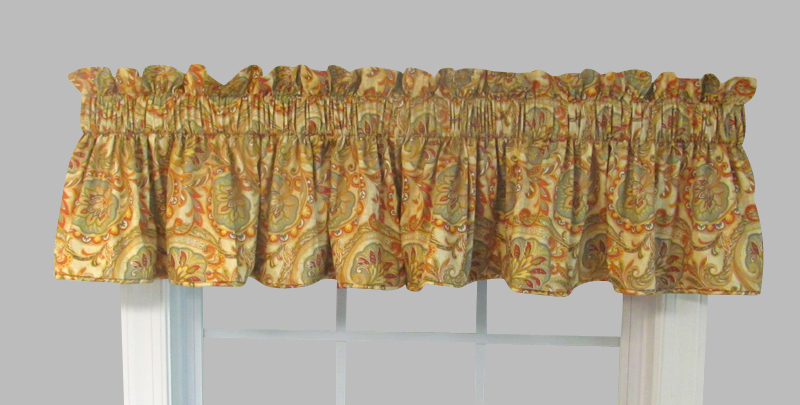 This lovely Pole Top Valance measures 54 inches wide and 18 inches long. It features a 3 inch rod pocket, 2 inch header, 1 inch side hems, and 1/2 inch bottom hem. Select White or Cream. Made of 100% Polyester and dry clean is recommended. 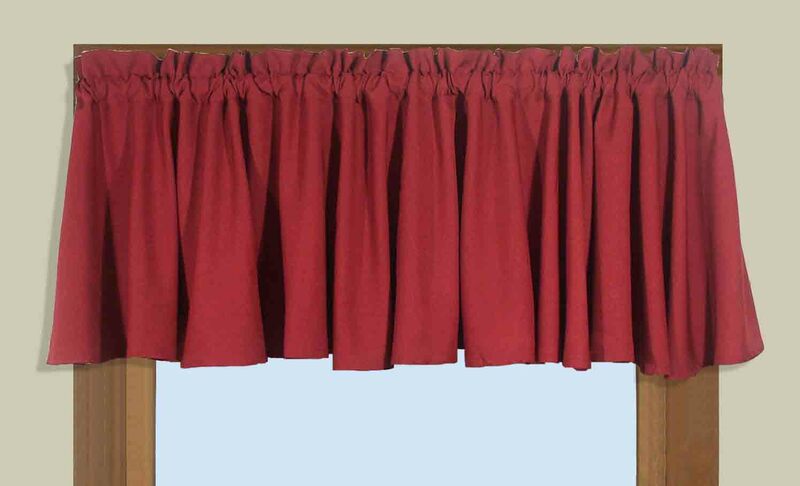 The Daphne Crimson Corded Filler Valance measures 50 inches wide by 16 inches long. Use it with the Swag Valance (from our Almost Custom by Faith Edward program) to accommodate wider windows or it look great on its own for any window measuring approximately 25 inches wide for a gathered look, or 40 inches for the flat look. 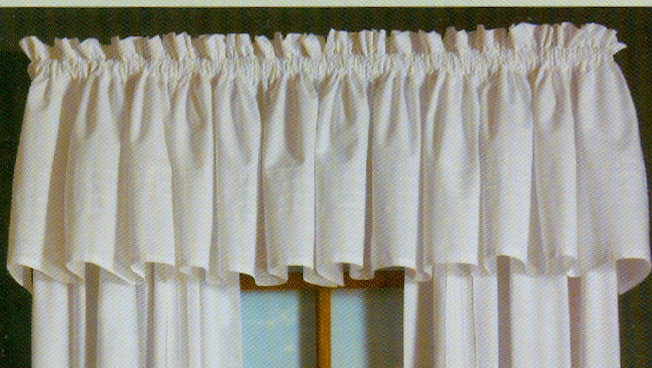 The Corded Filler Valance features a 3-inch rod pocket, 2-inch header and the self cording along the bottom edge makes this custom window valance flow perfectly when gathered on the rod. This custom valance is fully lined with high quality Luster Sateen lining (off white), the best quality in the industry. You will love the meticulous workmanship and fabric quality we put into making the best to be found anywhere. Use with a 2 ½-inch continental rod. 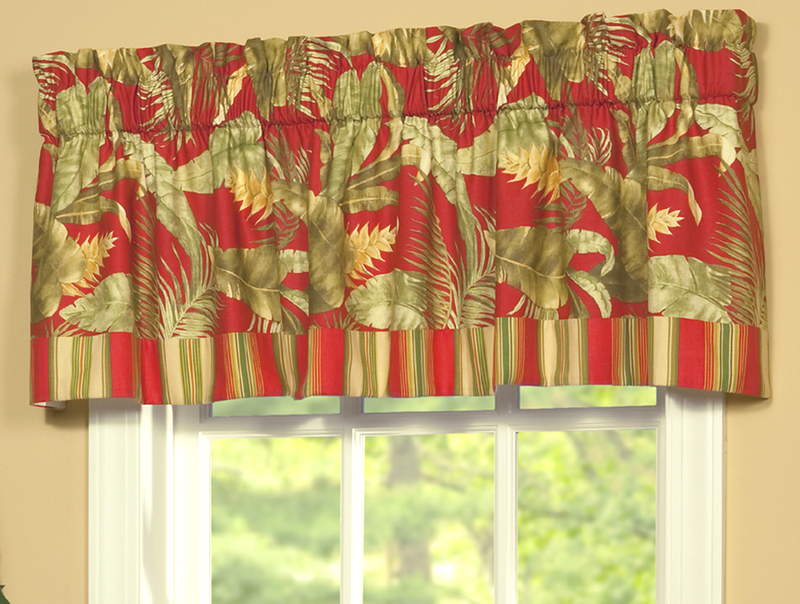 The Cozumel Tailored Valance, made of cotton duck fabric, is fully lined, has a 3 inch rod pocket and 2 inch header. It's made to gather on the curtain rod. Allow at least two times the width of your rod for proper fullness. Use either a decorative rod or a 2-1/2 inch continental for hanging. Multiples work well together to accommodate wider windows. Contrail rod pocket valance in a sensational textured jacquard, features wavey vertical lines in a satin finish on a matte ground. This tonal jacquard is both insulated and room darkening. It measures 50 inches wide by 16 inches long. Fabric face is made of 100% Polyester, the solid white back is a soft 100% Acrylic Suede. Other features include a 3 inch rod pocket, 2 inch header, 1 inch side hems, and 3 inch bottom hem. Machine washable. Traditional Spotswood Stripe in a large scale stripe in blue. The fully lined valance has a three inch rod pocket and two inch header. Use a 2-1/2 inch continental rod for hanging. Made in the USA of 100% Cotton. Tailored Valance fits inside the 2 piece Crescent valance to accommodate wider windows. With simple lines, the Fleetwood Insert Valance looks great on its own or with the Fleetwood two piece Swag. It has a 3 inch rod pocket and 3 inch header. Made of 53% Rayon, 47% Polyester with white lining material made of 65% Polyester and 35% Cotton. Hand wash in cold water, line dry. Do not dry clean or use bleach. Color combination is Chocolate, Tan, and Light Blue dots. Hydrangea is a gorgeous medium scale pattern design in blue with a hint of yellow on a white ground. Made in the USA of 100% Cotton 7 ounce duck cloth. The Tailored Valance features a 3 inch rod pocket and 2 inch header. Use a 2-1/2" flat continental rod or up to 1-1/2 inch diameter decorative rod. Chatsworth features a lovely traditional floral fabric design on an easy care polyester pebble beach base cloth. The Unlined Tailored Valance measures 70 inches wide and 15 inches long. Three color pallets are offered; Red features a pretty pink ground, Blue features an Ivory ground, and Grey has a Grey ground. Not lined, machine washable. Imported. Tailored valances are ideal for when you want to bring a crisp and clean look to your home décor. Sometimes called rod pocket valances, this style of valance features a rectangular shape and sometimes implements ruffles or scallops for a full, dimensional look. The Curtain Shop carries tailored valances for windows of all shapes and sizes, including windows in your kitchen or bathroom. Shop stylish patterns and solid styles in our store. We have the perfect tailored valance for your unique space, whether it be sharp and contemporary or decadent and traditional. Many of our tailored window valances are available in a variety of colors and sizes to suit your space and preferences. The Curtain Shop is happy to provide sample valance fabric so you can see and feel the option you choose before purchase. We've been in business since 1953 and carry the industry's highest quality designer brands.